If you are following me on Instagram, you must have seen glimpses of day 1 in Lisbon. These pictures are of day 2. When in Lisbon do a saree post for sure. The scenic beauty asks for it. All the pictures have been self-shot with a timer. The passer by’s gave so many compliments- “Bonita” ( beautiful). Some women stood and wanted to touch and feel the fabric. Sarees surely are a head turner. I shot these pictures at the two most scenic viewpoints of Lisbon- Miradouro Graca and Miradouro da Nossa Senhora do Monte. I am wearing a Panchrangi Rangavalli saree. These sarees are from Belgaum Karnataka mainly known as Panchrangi. This sarees have a gorgeous chequered pattern in a bloom of colours. The borders are unique matching the stripes in the pallu. If you plan on visiting museums and sites – and traveling via public transportation – the Lisboa Card can provide significant savings. With the Lisboa Card, all public transportation (including the Santa Justa Lift) is free, as are many museums, and top Lisbon sights – like St. George Castle Lisbon can be visited with a reduced admission fee. Although the public transportation options in Lisbon are ample, it can be confusing for anyone who isn’t used to using public transport. Find information about riding the trams (including the famous Lisbon Tram 28) here and click here a Lisbon Metro map. Easier to figure out that public transport is the Lisbon Hop-On Hop-Off Bus that makes stops at all the popular tourist spots. I think Alfama is the best area to stay in Lisbon, but anywhere in the Lisbon Old Town is ideal. I stayed in this awesome Airbnb Apartment. We have found that staying in apartments is often less expensive than hotel rooms – with the added benefit of a kitchen and, usually, more space. However, those who prefer staying in traditional accommodations won’t have any trouble finding a place to stay. There are many Lisbon hotels to choose from in – or close to – the city centre – which is the best area to stay in Lisbon for sightseeing. Budget travellers can search for Lisbon Hostels For a true bargain – and a unique experience – search for hosts on Couchsurfing, where travellers stay with locals for free. Lisbon can be reached by plane, train, bus or car. The Lisbon Portela Airport is the international airport. I took a cab to get from the Lisbon Airport to the city centre. If arriving/departing Lisbon by train or bus, there are several stations in the city. When booking travel by train or bus, pay close attention to the station of arrival/departure. Not everyone in Lisbon speaks English! Learn Spanish a bit prior to your trip! Lisbon is a walkable city…but only if you have the right shoes! Don’t forget to pack a pair of lightweight and comfortable walking shoes for your trip. We’re certain you’ll be snapping tons of photos during your trip. Rather than relying on your mobile phone to capture the sights, upgrade to an actual camera for higher quality photos. I travel with a Sony Camera (which takes amazing photos and is light and small). It’s easy to get turned around in any foreign city…and especially Lisbon! Make sure to have a good city map and/or guidebook before arriving. We think travel insurance is essential! Supposedly more secret lookout points, I found more tourists than locals at Miradouro da Senhora do Monte. Further north than Miradouro da Graca, but with a more elevated vantage point, it’s one of the most stunning Lisbon viewpoints. I suggest bringing a small picnic lunch or a bring-your-own adult beverage to enjoy along with the view. Enjoying my morning breakfast. Had ordered and started clicking pictures before the breakfast arrived. The city has many small cafes and bakeries with a lot of outdoor seating where you find people all the time. 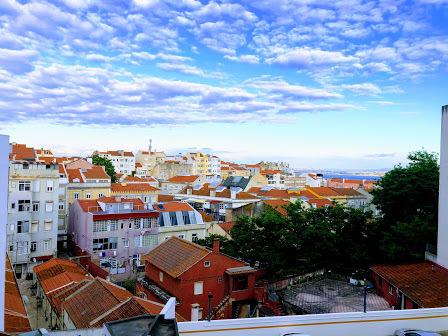 The Graca lookout in the Graca Lisbon neighbourhood is quite popular, both for the easy-to-find location and proximity to the St. George Castle Lisbon (Castelo de Sao Jorge). It is one of my favourite viewpoint for wide city views and watching the sunset in Lisbon. When in Lisbon, Porto wine is must. Lisbon has many bakeries and they are really amazing. Must try. The venue for our milongas. It is beautiful.